Getting to Know Your SEO: An Interview with SEOA's Stone Reuning - SEO Eblog by SEO Advantage, Inc.
We hook a Snook! Stone Reuning and his son, Max, on one of their fishing trips. Stone Reuning has been doing SEO since the pre-Google era, back when Yahoo was the king of search. That alone would be impressive, but it’s really just part of the story. When it comes to decision support cred, it doesn’t get much better than Ernst & Young, and that was only one stop along Stone’s 25-year career in consulting and business services. 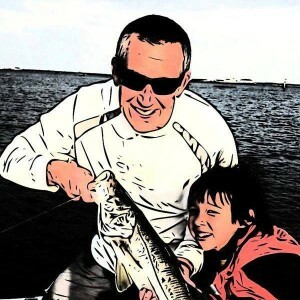 He and his brother Wes – an SEO Advantage partner and Executive VP – both worked with Fortune 500 companies before teaming up to form Tampa Bay Associates, where they developed and implemented business solutions. Then, in 1999, the Reuning brothers created the venture that would become one of the internet’s most innovative and successful SEO companies: SEO Advantage. Stone and I “sat down together” in the virtual office this week, and he told me the story of how SEO Advantage was formed, and how Stone and Wes saw an opportunity and seized it at a time when SEO and mainstream internet use were still in their infancy. Thus SEO Advantage was born, and in the years since it has stayed on the forefront of every SEO development, adapting to algorithm updates when necessary, but usually surviving those updates relatively unscathed. This is a credit to Stone’s forward-thinking leadership and ability to see the future of search before it happens. It’s also the direct result of the fact that, unlike many SEO executives who become completely disconnected from the day-to-day operations of their companies, Stone works in the trenches. He remains directly involved with every single client SEO Advantage serves. “I’ve always viewed clients as business partners,” he continued, “I ask them, ‘what are your problems? What are the things you’re trying to solve? What keeps you up at night?’ I like to form long-term relationships with clients. Some have been with us for over a decade. Building these relationships, to me, is the right way to do business.” Considering SEO Advantage’s success, that’s not just an opinion. The company’s record has been proven time and time again, to the benefit of clients in fields from law to medicine to precious metals. Another contributing factor to that success is the company culture that has evolved over the years. SEO Advantage employs a virtual office approach, and although Stone is hands-on with every client, he doesn’t micromanage, preferring to give his employees a sense of ownership over their work. To wind things down on a casual note, I asked Stone what was the one thing he couldn’t work without during the day. I expected him to say something like coffee or music, but instead I got one more indicator of how passionate he is about his work. Some marketers see the internet as a means to an end, but to Michelle it’s a vibrant global community. As Director of Premium Content for SEO Advantage, she helps clients earn high-quality links, build relationships, and grow their social media audience by making sure their online presence speaks to real people and not just algorithms. Outside of work she spends time with her beloved pets, enjoying nature, reading speculative fiction, and using years of intensive vocal training to rock out on karaoke night. Connect with Michelle on LinkedIn.